February 20th; Social justice is an underlying principle for peaceful and prosperous coexistence within and among nations. We uphold the principles of social justice when we promote gender equality or the rights of indigenous peoples and migrants. We advance social justice when we remove barriers that people face because of gender, age, race, ethnicity, religion, culture or disability. The International Labour Organization unanimously adopted the ILO Declaration on Social Justice for a Fair Globalization on 10 June 2008. This is the third major statement of principles and policies adopted by the International Labour Conference since the ILO’s Constitution of 1919. It builds on the Philadelphia Declaration of 1944 and the Declaration on Fundamental Principles and Rights at Work of 1998. The 2008 Declaration expresses the contemporary vision of the ILO’s mandate in the era of globalization. This landmark Declaration is a powerful reaffirmation of ILO values. It is the outcome of tripartite consultations that started in the wake of the Report of the World Commission on the Social Dimension of Globalization. By adopting this text, the representatives of governments, employers’ and workers’ organizations from 182 member States emphasize the key role of our tripartite Organization in helping to achieve progress and social justice in the context of globalization. Together, they commit to enhance the ILO’s capacity to advance these goals, through the Decent Work Agenda. The Declaration institutionalizes the Decent Work concept developed by the ILO since 1999, placing it at the core of the Organization’s policies to reach its constitutional objectives. The Declaration comes at a crucial political moment, reflecting the wide consensus on the need for a strong social dimension to globalization in achieving improved and fair outcomes for all. It constitutes a compass for the promotion of a fair globalization based on Decent Work, as well as a practical tool to accelerate progress in the implementation of the Decent Work Agenda at the country level. It also reflects a productive outlook by highlighting the importance of sustainable enterprises in creating greater employment and income opportunities for all. The General Assembly Recognizes that social development and social justice are indispensable for the achievement and maintenance of peace and security within and among nations and that, in turn, social development and social justice cannot be attained in the absence of peace and security or in the absence of respect for all human rights and fundamental freedoms. It further recognizes that globalization and interdependence are opening new opportunities through trade, investment and capital flows and advances in technology, including information technology, for the growth of the world economy and the development and improvement of living standards around the world, while at the same time there remain serious challenges, including serious financial crises, insecurity, poverty, exclusion and inequality within and among societies and considerable obstacles to further integration and full participation in the global economy for developing countries as well as some countries with economies in transition. 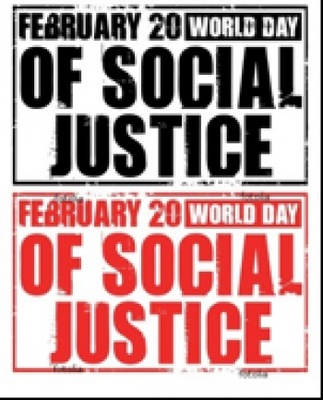 On 26 November 2007, the General Assembly declared that, starting from the sixty-third session of the General Assembly, 20 February will be celebrated annually as the World Day of Social Justice. Indeed there will never be peace without justice, unless that is, one means the peace found in a cemetery. That is something that all global trotters in anxious search of business opportunities and reducing cultures and religions to their lowest common denominators as management problems ought to seriously ponder before advocating their globalized prosperity. Indeed, We Need to Re-Imagine, Re-Define and Re-Envision what Real, Just and True Prosperity is - Individually and Collectively for the Sakes of OurSelves (Humanity) and Our Living Planet.